BROOKLYN — Already in possession of one upset during their Atlantic Coast Conference tournament stay, Miami sought to slay another giant, one they had defeated in the regular season. Trailing regular-season conference champion North Carolina by three early in the second half, the Hurricanes had the opportunity to make a significant run, but were done in by 30 percent shooting and a 12-3 Tar Heel run to turn their three-point deficit into a 12-point hole as they fell to UNC by the final of 78-53 in a quarterfinal matchup at Barclays Center. 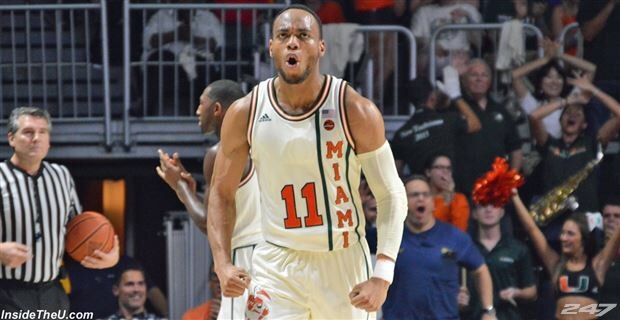 While freshman Bruce Brown led Miami (21-11) and all scorers with 21 points, it could not fully overcome the staunch UNC defense, which forced 15 Hurricane turnovers and rendered just a 5-for-21 effort from three-point range. Aside from Brown, no other Hurricane scored more than seven points, while Isaiah Hicks’ 19 points led four Tar Heels in double figures. The lack of sharpness Larranaga hinted at was not evident at the start of the game, as Miami took an 11-6 lead by going to Brown; who scored 30 points in the Hurricanes’ 77-62 win over UNC on January 28, to set the tone in the opening minutes. It seemed to work, but then a 15-3 Tar Heel run gave the top seed a lead it would not relinquish. Miami hung tough after that, though, closing the opening stanza on a 7-0 run by taking advantage of an uncharacteristically sloppy sequence of events by UNC to conclude the half. Trailing 34-22 with 1:15 to play before the intermission, the Hurricanes got a conventional three-point play from D.J. Vasiljevic before Brown secured a rebound on Kennedy Meeks’ errant jumper and proceeded to go coast-to-coast. Then, Anthony Lawrence, Jr. stripped Seventh Woods and dished to a streaking Brown, whose breakaway dunk brought Miami within five at the horn, going into the locker room down 34-29. Kamari Murphy’s layup to start the second half got the Hurricanes within one possession, trailing 34-31, but it would not get any closer after that, as UNC built a double-digit lead that they would maintain for the majority of the final minutes. The good news for Miami is that with several other ACC teams on the bubble heading into Selection Sunday, their standing as an NCAA Tournament team is relatively secure. With a weeklong hiatus before they presumably take the court again among the field of 68, the Hurricanes will use the time to refocus in the hope of making a deep run into March.